Flipbooks Online is a brand new service for 3D Issue that allows companies and their teams to publish their digital magazines, documents, reports, brochures and catalogs online both faster and easier than ever before. It is designed for publishers who want the ‘click and go’ experience. Publishing in a fraction of the time while also maintaining and retaining all of the key features that have made the desktop software so popular. Click on the video link below for a quick tour. The release of Flipbooks Online makes 3D Issue the only suitable solution that provides an online service along with desktop solutions for both PC and MAC. We ensure that no matter how your team wish to manage your digital publishing strategy, we’ve got you covered. Flipbooks Online is 10 times the speed of the desktop software. The reason for this is that this platform is built on ultra fast servers whose only purpose is to convert and publish digital editions. As an online service you are no longer forced to work from the desktop that you have installed the software on. This platform allows you and your team to access Flipbooks online from anywhere with a web connection. Allowing you to publish ‘on the go’ by uploading your PDFs directly to our cloud and have them transformed into stunning HTML5 digital publications in a matter of seconds. Flipbooks Online comes complete with an integrated team CRM which will allow you to add your team members to your account. Through this CRM you can decide on the level of permissions that each team member can have. You can allow your colleagues to have full access to everything or you could limit team members to specific brands / publications or projects. As the account administrator you will have full control over all accounts enabling you to review all activities, publications and statistics on account usage. One of the concerns that some publishers have is that by hosting their digital magazines on a site separate to their own they are directing traffic from their website. Flipbooks Online provides you with a solution where you can avail of the best of both worlds. Our platform is built on ultrafast dedicated servers whose sole purpose is to convert, publish and host digital publications. This guarantees that your audience have a fast and reliable reading experience. We also provide you with the option to mask your publications so that they appear listed as a subdomain on your website such as https://flipbooks.YourWebsite.com. This allows you to continue to avail of our fast publishing service while at the same time enabling you to encapsulate your audience, traffic and SEO on your website. Flipbooks Online offers all the key features that our customers love in the Desktop software such as the access to the interactive editor. These features include the embedding of videos, animations, audio, image galleries, web links, menus and much more. As with our desktop software you still have total control over the look and feel of your digital magazine designing your layout options, ensuring that your digital publications can be tailored to suit your company’s branding. While developing this platform, we have also kept our partners at the forefront of its design. Flipbooks Online has been built as an open API meaning that not only can you manage an infinite number of clients and their publications and brands from within the platform but you can also whitelabel the entire platform and offer it as your own product or service. This would allow you to completely alter the platform to display your own branding and mask the domain so that the platform and all of the publications appear listed on your site. The integrated CRM will allow you to manage user access and create new clients or team accounts with ease. Our Flipbooks solutions are the only service available that creates 2 instances of each publication that you convert. One for your desktop audience and one for your mobile audience. Why? You may ask. If you look at your web traffic you will see that your mobile audience surpasses your desktop audience. But all digital magazine services force your mobile audience to download the same large files that your desktop audience use. 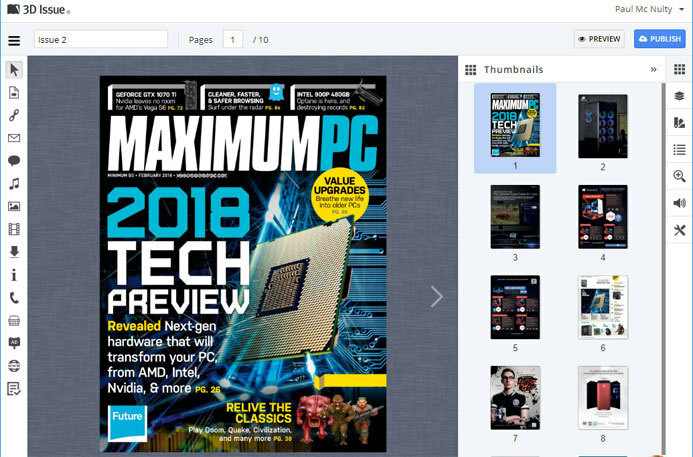 As mobiles have resolution, processing and storage limitations, this often degregates the experience when compared to viewing your digital magazines on the more powerful desktop computer. 3D Issue have developed a patented tiling solution that solves this problem. It splices each page of your publication into hundreds of smaller images . This ensures that your mobile editions only have to download the images that it requires when it needs them guaranteeing that your mobile audience have the same rich and fast experience as your desktop audience. Flipbooks online will constantly be updated with new features and services. All of which will be instantly accessible when you sign into Flipbooks? to you as a Flipbooks. 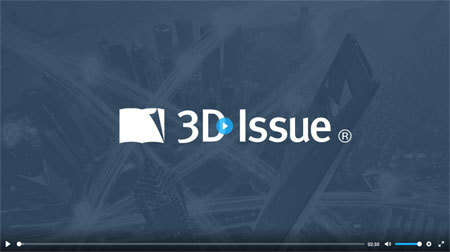 With all of the changes that are made within the software, 3D issue will provide you with all of the upgrades and enhancements to your account the instant they become live to the public. Your content is upgraded automatically to the best quality in order to provide you with only the best publications to which you can supply to customers and clients of your own.